Rated at 2500 lbs, these lines greatly exceed required strength. Supple, flexible, yet extremely durable. The 7mm accessory cords come in different colors. 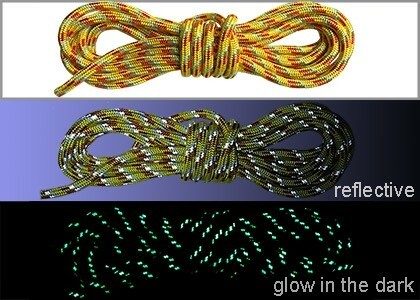 The 7.5mm Nightline glow-in-the-dark, reflective safety line is designed to work best with the Sky Track with respect to the pulley, ratchets, and rope clamps. Shop here to re-order or purchase rope separately but if you're looking to get the Sky Track Aerial Dog Run, you'll be able to choose the Nightline in up to 500 feet via custom options.